During the 1920s, no American gang was more feared than Detroit’s Purple Gang, also known as the Sugar House Gang. The Jewish-led gang controlled the transportation of liquor into Michigan from Canada, and their ruthless tactics convinced Al Capone that it was safer to work with them than compete with them. Despite the gang’s infamy during Prohibition, the Purple Gang’s name has not remained in America’s consciousness to the same extent as the 20th century gangs of Chicago or New York. 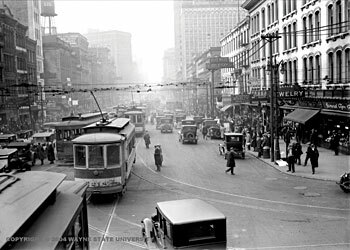 Detroit as a city busting at the seams due to growth spurred by money from the automobile industry and an influx of European immigrants and southern Blacks. The story begins with eight-year-old Joe speaking Polish to himself while running through the streets of Detroit. The first chapters are filled with elaborate details about the life of a Polish-Catholic immigrant family in Detroit’s Polish neighborhoods near St. Josaphat’s Church. Anyone who has eaten traditional Polish food will salivate at the descriptions of the pierogi, golabki (stuffed cabbage), and other meals that Joe’s mother serves. At first, young Joe’s only fears are that his Catholic school nuns will punish him for some minor transgression and that his next-door neighbor cousins will tag along on a family trip to Boblo Island. However, while Joe is worried about childish matters, Detroit keeps growing. Eventually World War I and Prohibition force Joe to grow up with his city, and he associates with the Sugar House Gang to help his family survive. At first, the story feels like it might be only a portrait of the Detroit that was and the famous people that populated or visited the city. Young Joe travels to many of the city’s famous sites, such as Grinnell Brothers Music House, the Boston-Edison neighborhood, the streetcars of Woodward Avenue, a Tigers game at Navin Field, and the Sanders Candy Palace of Treats. Scheffler describes each building, street corner, and house with the finest details. A reader with an interest in the history of Detroit, like me, will appreciate this detail, but other readers might be waiting for the story to build up. Luckily, the story matures with Joe. With the onset of Prohibition, Joe becomes caught in an exciting but dangerous world that would have seemed unimaginable to the rule-following boy at the beginning of the novel. His world expands beyond Detroit as he finds himself working in the Downriver communities of Wyandotte and Grosse Ile. Real-life historical figures, including Sugar House Gang members, populate Joe’s world. Boats (and cars in the winter) cross the Detroit River, bringing Canadian liquor to Michigan. Cops are on the take, and speakeasies pop up throughout the city. Gang wars erupt, and drive-by shootings and violent shakedowns become commonplace. Joe struggles to survive in this world without losing the values of his family, community, and church. The Sugar House is a must-read for anyone who is interested in Detroit’s history or anyone who wants a thrilling tale of a young man trying to remain morally strong in the face of a corrupt world. Detroit area native Scheffler clearly did her research, and the reader is rewarded with characters that feel real and a view of Detroit’s past that is not easy to find. The Sugar House is currently available in both paperback and Kindle format at Amazon.com here. On Wednesday, I will be featuring a Q&A with Jean Scheffler in which she talks about her research, writing process, and her grandfather who inspired her novel.